The EKU Army ROTC Colonel’s Battalion sent 11 Cadets to participate in the German Armed Forces Badge for Military Proficiency Competition hosted by Indiana University’s Army ROTC in Bloomington, In. The Colonel’s outperformed all other Kentucky schools in the competition and earned an overall ranking of Fifth out of the 34 schools present with eight of our 11 Cadets receiving the coveted badge. The German Armed Forces Badge for Military Proficiency is one of the sought-after and few-approved foreign awards for members of the U.S. military. Originating in the German Army in 1960, it was made available to U.S. service members in 1972. It is one of the few decorations Cadets can earn and continue to wear after they are commissioned. The badge is awarded in three grades: Gold, Silver, or Bronze. Each grade is awarded based on the Cadets’ performance in marksmanship, swimming, track and field, first aid, and a foot march. The first event began late Friday night on the 22nd of February with the Cadets completing a 200-meter swim within six minutes. Early the next morning, the team successfully conducted the 5k run. Mid-morning our team suffered the first lost. One member did not meet the required number of target hits during the 9mm pistol event, while three others only achieved the required score for the Silver Badge. The other seven Cadets remained in the running for the Gold Badge. In the afternoon, the team lost another Cadet during the First Aid Knowledge Test. Even though two Cadets were out of the running for the German Armed Forces Badge for Military Proficiency, they continued to motivate their team and participate in all events – a shining example of the Warrior Spirit our EKU Cadets possess! The day’s events concluded with track and field which consists of three primary events: long jump, shot put and a 100m sprint, and three alternate events: high jump, stone throw and 400m sprint. Cadets are given three attempts to complete each of the track and field events. The shot put event removed one more Cadet from the competition while the stone throw event kept tensions high. At the stone throw, Cadets must twice hurl a stone weighing approximately 33lbs over a combined distance of 2.67 meters (8.75 ft). 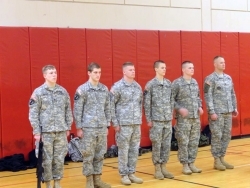 One Cadet had thrown inches short on the first two attempts. The remainder of the team, in full support, rallied around the Cadet for his final attempt. His first throw flew over half the distance, and sigh of relief washed over the team as his second throw almost surpassed his first. The team was anxiously quiet while the officials measured the throws. They roared with cheers as the officials announced the Cadet’s successful final attempt! Eight Cadets remain in the competition – five still competing for the Gold Badge and three still competing for the Silver Badge. All that stood in their way of success was the foot march the following morning. The foot march is comprised of three different distances and times depending on which badge Cadets are trying to achieve. The Cadets competing for Gold are required to complete a 15km foot march within two hours, while the Silver and Bronze competitors’ distance and time is less. All rucks must weigh at least 33lbs. The three EKU Cadets competing for the Silver Badge still elected to do the Gold route with the rest of their team. At 0800 on Sunday the 24th of February, all 11 Cadets stepped off to complete the Gold route foot march and the last one finished at 0953. The competition ended with an outstanding performance from all of the participating Cadets. That afternoon the German Sergeants Major Frank Zindel, the German Army Liaison, awarded five Gold and three Silver German Armed Forces Badges for Proficiency to the Cadets of EKU ROTC. With a total of eight badge winners, CDT Wamsley, Buford, Gramig, Thompson, and Williams won the Coveted gold badge. CDT Frizzelle won the Silver badge overall. EKU ROTC has started this New Year off on the right foot, l mean the left. CDT 1SGT Creutzinger (JR, Homeland Security) Cincinnati, Oh. CDT PFC Thompson (FR, History) Radcliff, Ky.
CDT 2LT Frizzelle (JR, History) Greenville N.C.
CDT CPL Gramig (SO, Business) Honolulu, Hi. CDT CPL Buford (SO, Homeland Security) Jamestown, Oh. CDT CPT Wamsley (SR, General Computer Information Systems) Long Beach, Ca. (Not Pictured) CDT CPL Williams (SO, Computer Science) Louisville, Ky.